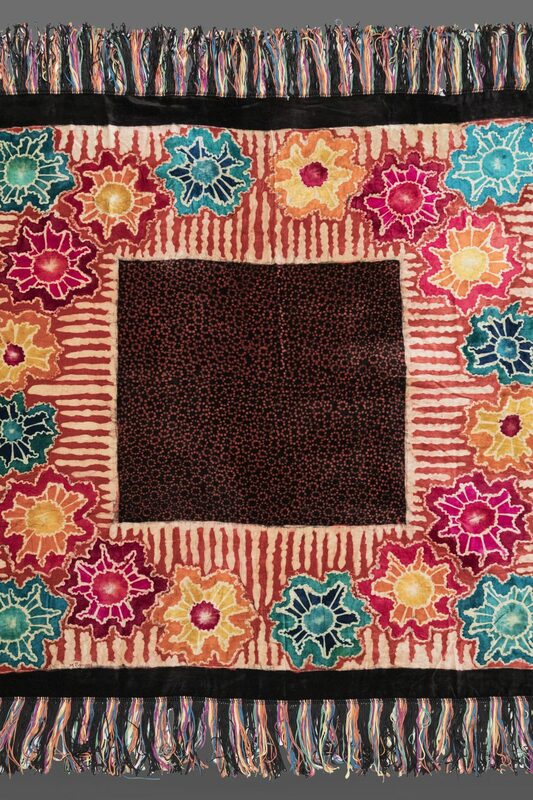 This large velvet shawl, worn more for the visual impact than warmth, has been printed with an extremely striking design in batik. This labour intensive form of resist dyeing involved painting fabric with a pattern in liquid wax before immersing it in dye, repeating this a number of times to build up a multicoloured design. 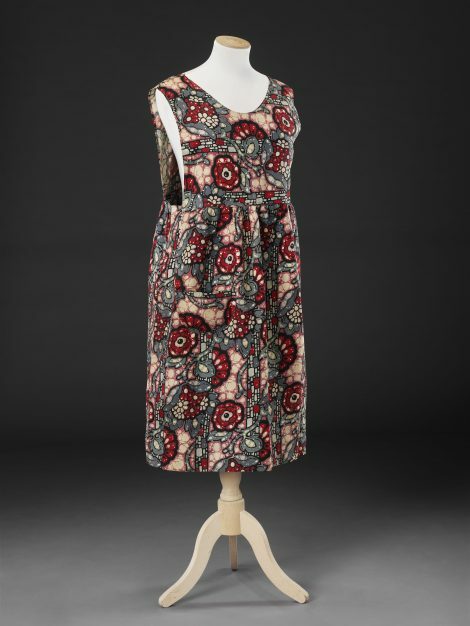 Batik was an ancient form of printing used in many areas of the Near and Far East, but particularly associated with the Indonesian island of Java, once part of the Dutch East Indies. In the later 19th Century the Dutch introduced the method into Europe where it became part of the fashionable interest in exoticism and in traditional craft techniques that were reestablished in the production of garments and dress and interior accessories. The time-consuming process was reflected in the cost of such items, limiting them to an affluent market. One of the most influential and fashionable purveyors of these luxury goods was the designer of this shawl, Marguerite Pangon. Pangon was impressed by the Javanese batiks on display at the Paris Exhibition of 1900, and at the Turin Exhibition of 1902 where she probably also saw the work of the Dutch Agathe Wegerif -Gravestein who experimented with batik on a number of materials including velvet. After studying the technique at the Haarlem Laboratory Pangon opened her own studio in Paris in 1916 employing fifty people to design and make clothes, shawls, fabrics and soft furnishings. This workshop was said to have provided the model for many others that gave employment to young girls. In its February 1921 issue La France , an American magazine, wrote that ‘Batiks have become the fad of Paris. Their popularity is due in no small measure to Madame Pangon who has revealed the wonderful possibilities of this art… [she] has departed from Javanese traditions and conceives her designs in a manner infinitely imaginative and refined.’ (https://babel.hathitrust.org/cgi/pt?id=mdp.39015023192761;view=2up;seq=230) Describing herself as an ‘Artiste-Décorateur’ Pangon advertised in the upmarket fashion periodical Gazette du Bon Ton, and in 1925 published her own lavish book Les Batiks de Madame Pangon with a text in French and English containing forty two unbound plates of her batik designs (see https://digital.wolfsonian.org/WOLF071850/00001/1j). 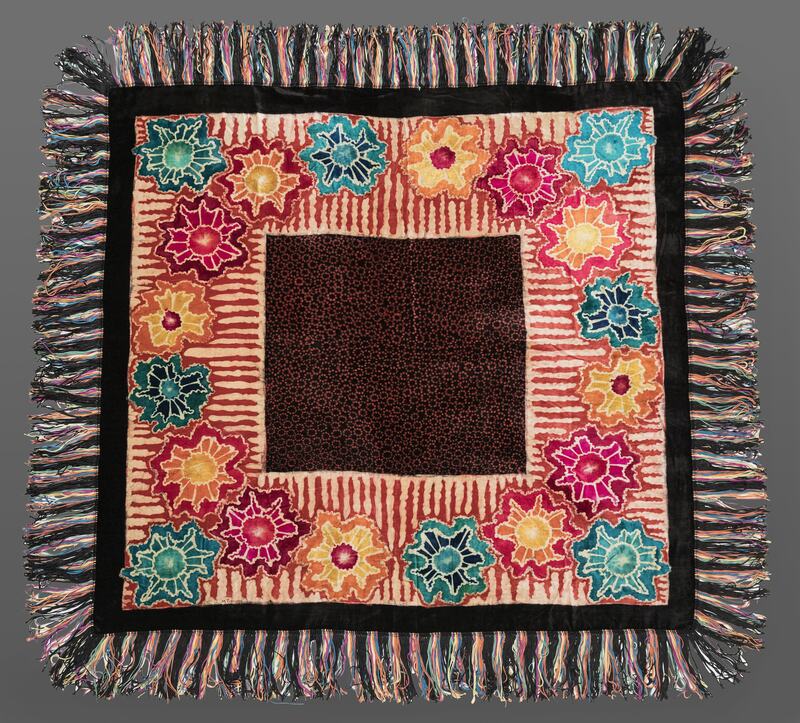 These show her love of the large stylised flowerheads in strong contrasting colours that create such an impact on this shawl and her expressive use of shape and line, often appearing to explode like fireworks. The characteristic fine cracked lines caused by the dyes seeping through the hardening wax were prized in the West as evidence of the hand process but could be seen as imperfections by traditional practitioners.